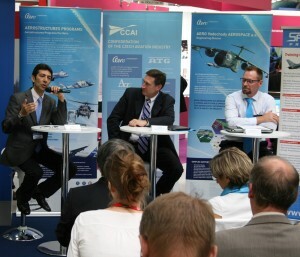 The successful forum focused on the innovation in the aviation industry was held at Paris Air Show on June 18 at 10:30 am organised by the Confederation of the Czech Aviation Industry with support of the Embassy of the Czech Republic in France. Key panellists provided valuable contributions from different perspectives of specialist, integrator and global player. The speakers also provided evidence that the Czech Republic is an ideal place for engineering works as there is a considerable expertise in design, development and testing of numerous aircraft types, systems and aero engines. Farnborough Air Show 2012. The panel of industry leaders and experts provided unique insights in global trends and challenges and their implications for European industries and the Czech Republic in particular. Our honourable guests included representatives from Embraer S.A. and GE Aviation Czech s.r.o. among others.